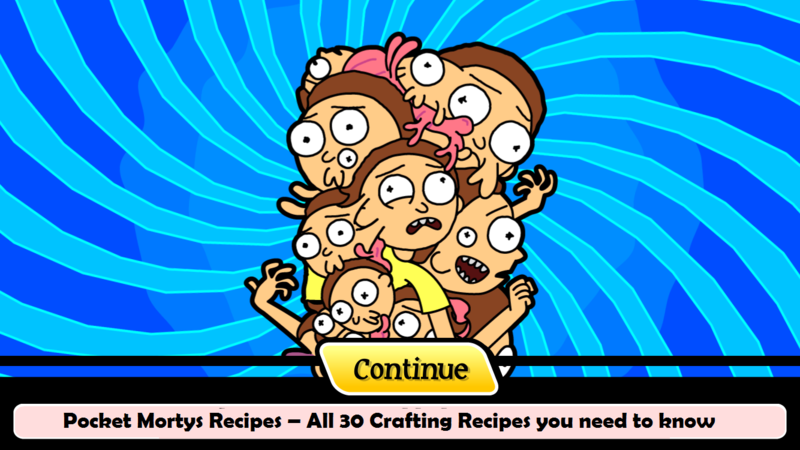 In this article I am going to show you all crafting Pocket Mortys Recipes used in Pocket Mortys game that you need to know. Keep Reading!! 1 What is Pocket Mortys? 1.1 How to Play Pocket Mortys Game? How to Play Pocket Mortys Game? In this game all you have to do is to control character named Rick. Game starts from rick’s garage. Mysterious rick enters there and challenge player to play Morty Battle. Player have to defeat him. To get gun (which is placed in portal) back player have to defeat 6 heads rick. Player have to fight from various dimensions and collect rick’s badges. After defeating him player will have to fight each type of Mortys. Crazy!! Isn’t it?? Concept of this game is to collect mortys, fight each others (especially rick) and collect badges. Some Base Items which cannot be made by any recipes but using them you can make different recipes. They are found mainly in dungeons. Circuit Board, Battery, Cable, Tin Can, Bacteria Cell, Fleeb, Turbulent Juice Tube, Attack Mega Seed, Defense Mega Seed, Speed Mega Seed are Base Items of Pocket Mortys Game. Purpose – Morty Manipulator Chip captures a wild Morty with low health. Purpose – Serum heals 20 HP. Purpose – Great Serum heals 50 HP. Purpose – Sensational Serum heals 200 HP. Purpose – Pure Serum heals all HP. Purpose – Plutonic Rock adds 50% of AP to all attacks. Purpose – Pure Pluctonic Rock restores full AP to all attacks. Purpose – Halzinger restores a dazed Morty to 50% HP. Purpose – Pure Halzinger restores a dazed Morty to 100% HP. Purpose – It increases one level of any Morty. Purpose – It is used in making almost every Recipe. Purpose – Supercharged is superior level of Normal Battery. Purpose – Microverse Battery a box of slavery with extra steps. Purpose –Purified Fleeb is most potent form of Fleeb. Purpose – Dark Energy Ball repels matter with a dark force. Purpose – Dark Matter Ball emits a strong Gravitational pull. Purpose – Motherboard is an ideal base for complex electronics. Purpose – Robot can be programmed for anything, either good or bad. Purpose – Why to reach for the butter yourself when Butter Robot can do it. Purpose – Time Crystal divides time into multiple zones. Purpose – Time Stabilizing Collar merge multiple time zones into one. Purpose – It is used to watch Television from any dimension. Purpose – Neutrino Bomb kills all the living things. Purpose – It see through the eyes of another you. Purpose – This Helmet increase IQ power of wearer. Purpose – How far can look Roy? How to Download Mobdro for Windows PC?